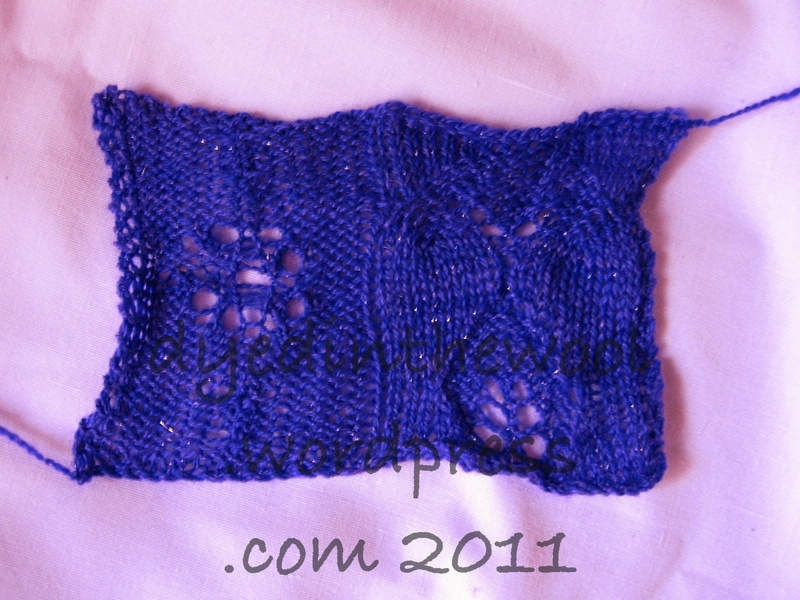 A finished object! 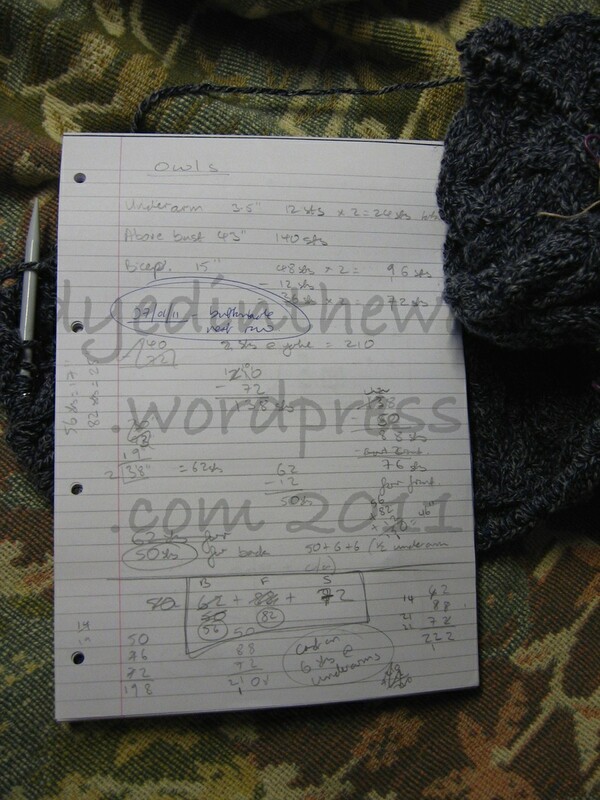 From … searches Ravelry … AUGUST?!?! Well, at least it’s August 2011! In-out-in-out, you shake it all about! Mojo Mitts in the remnants of the Zauberball I used for my Serpentine Socks (with a little help from another yarn for the thumbs). 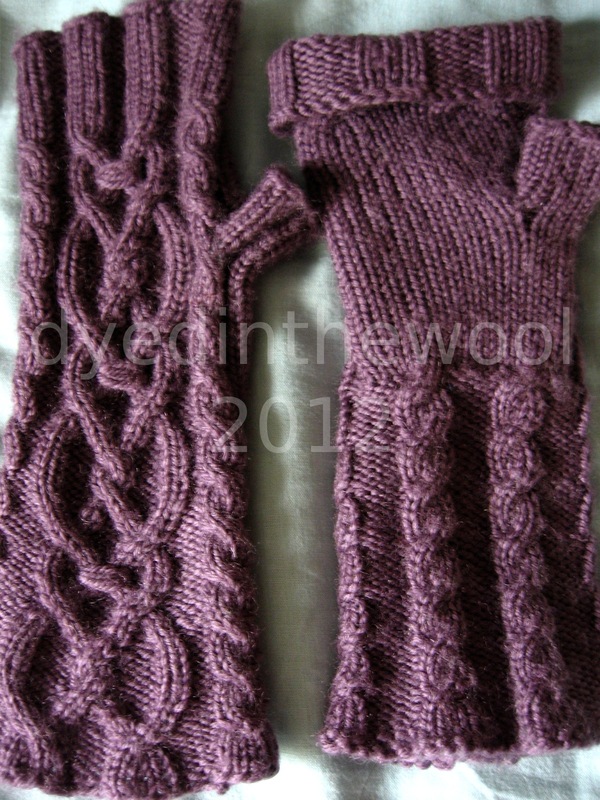 And another FO, this time from January of this year. Positively on time. 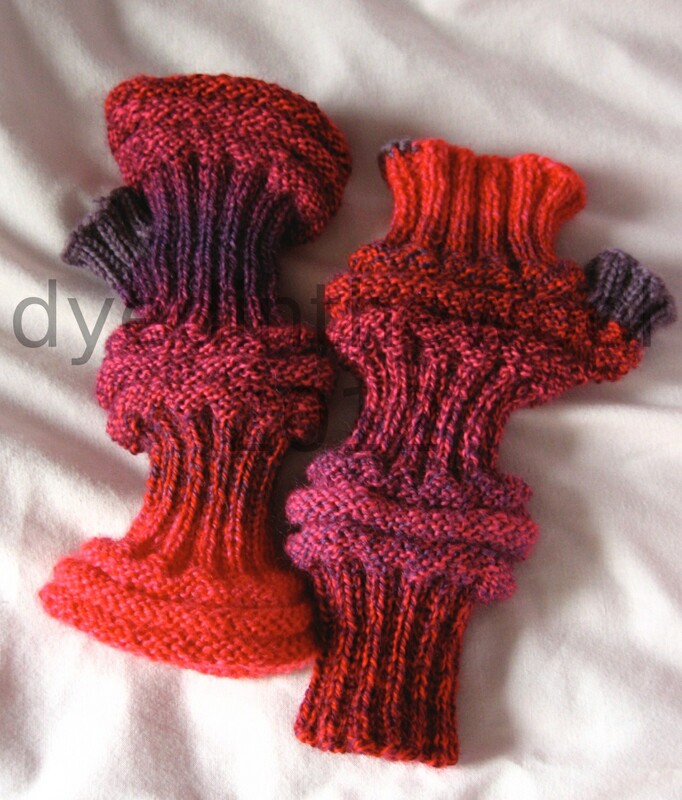 Evenstar Mitts designed by audm and made in King Cole Anti-tickle Merino. Click on the links for more details/photos. And finally, a work in progress! Clue 1 complete and Clue 2 on first glove covered up to prevent spoilers. Personal stuff: I’ve been to see my GP and she’s put me back on a low dose of my previous happy pills to try and sort the withdrawal symptoms out. So far, I’m like Tigger in comparison to my Eyore of last week. 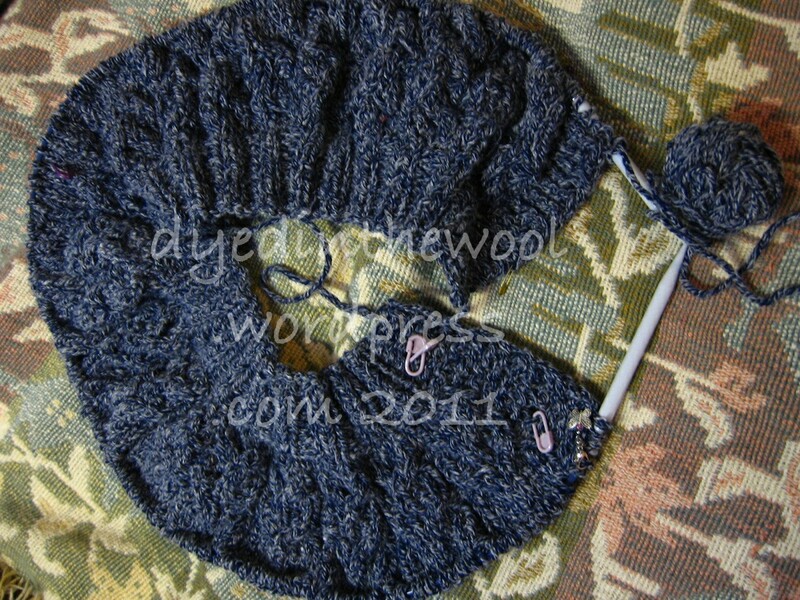 I’ve now finished one side of the attached collar and started on the other side. I made a second one because I ran out of yarn on the border of the first and I really need to make sure you can make it with a set amount of yarn. So the one I showed last time is now the prototype/chef’s privilege. I messed up a couple of parts of the stitch pattern but it’s more-or-less there. It looks better with the light shining through so please excuse the ultra-glam photo of the swatch being held in place on my vertical blind by hair clips! She is a speshul snowflake angel of the highest order. And I mean that in a nice way! I’ve given up on the chunky chenille CARDIGAN OF DOOM (more on it’s fate in a future post) and instead I’m making Enid from the Winter 2006 issue of IK. The prescribed yarn (Reynold’s Whiskey) is a sport-weight 100% wool yarn and I may have found a yarn which fits with her requirements. Mostly cotton or acrylic. Dark and versatile colour. MACHINE WASHABLE (that one’s very important). And not going to break the bank. 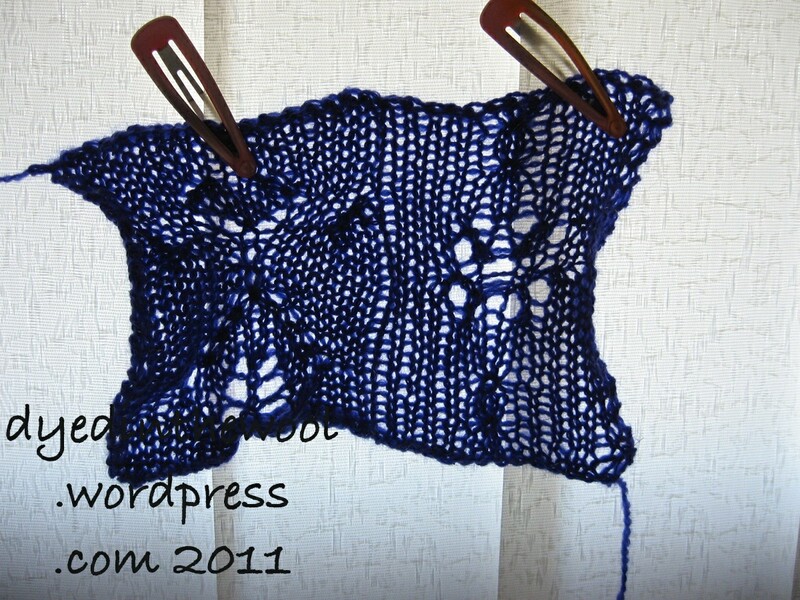 Sirdar Click DK in Deep Blue!!! 70% acrylic and 30% wool. 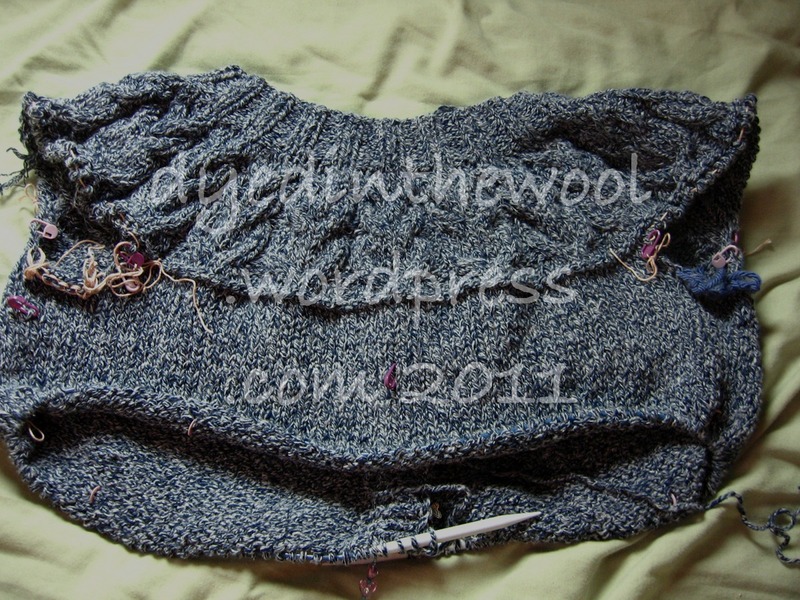 I’ll be digging into my DK and sport-weight stashes to work the circles on the yoke so I’m ready to go. What are my chances of making it for her birthday at the end of March? Yeah, I know. You can stop laughing now! Title of today’s post brought to you by my spam filter! 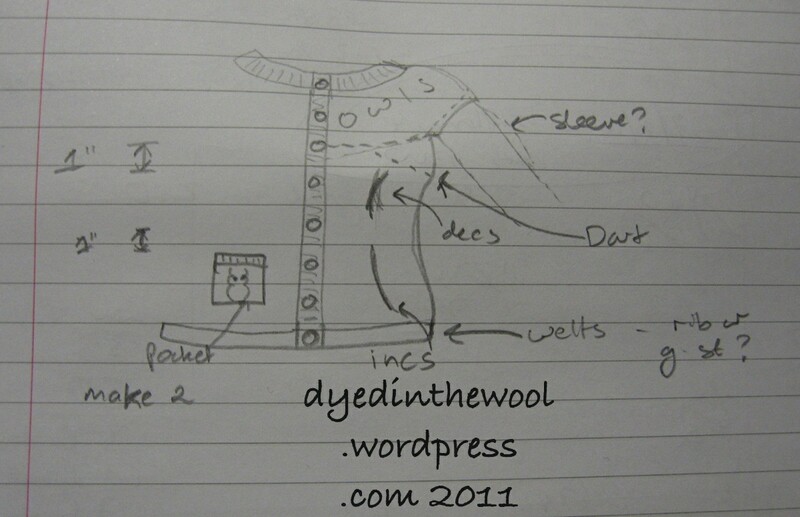 I’ve made progress on my owls cardigan. I had to use my daylight lamp to get enough light to photograph so excuse the slightly washed-out look. There’s only so much to can do with a free image software toolbar! 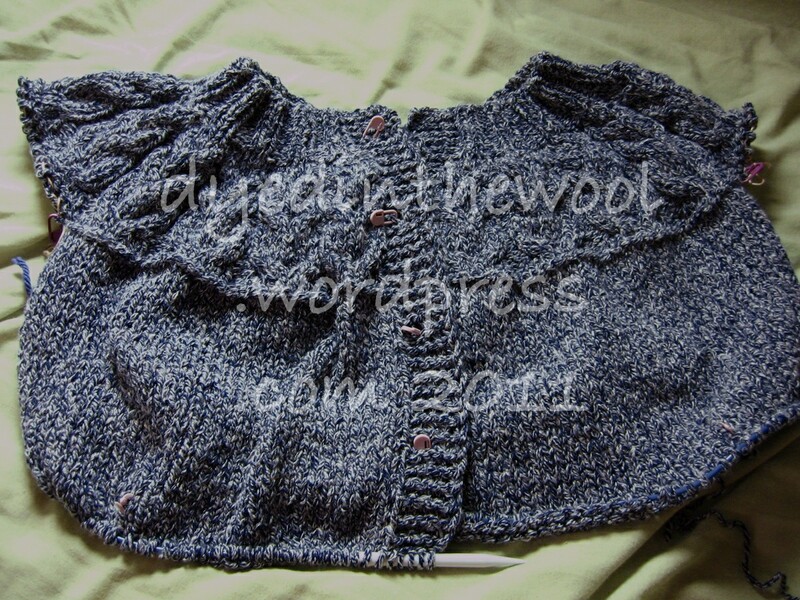 owls cardigan fronts. Pink stitch markers show buttonholes. 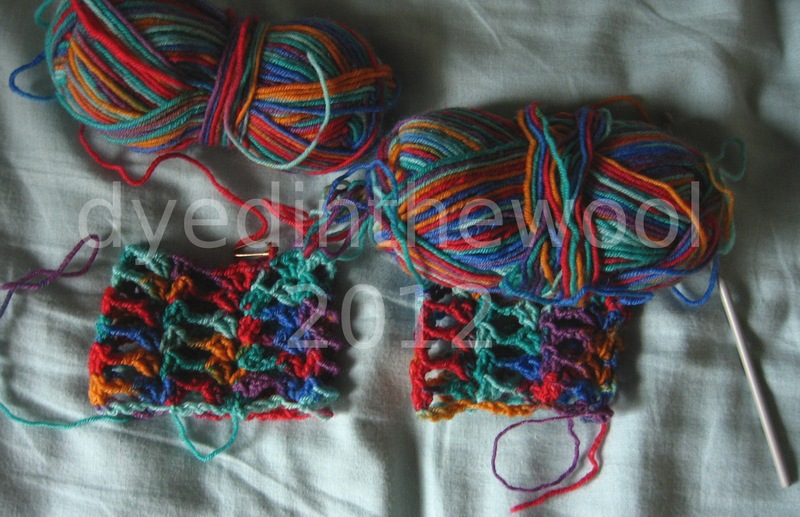 The short rows have worked out well and dropped the fronts down nicely. I’m working the waist decreases alternately at the sides and the middle of the pieces to give some more uniform shaping. I’ll do the same when increasing for the hips. The unequal split for the fronts and back has worked well and while it looks odd laying flat, I can assure you that the fit is good. Nice and roomy in the front! 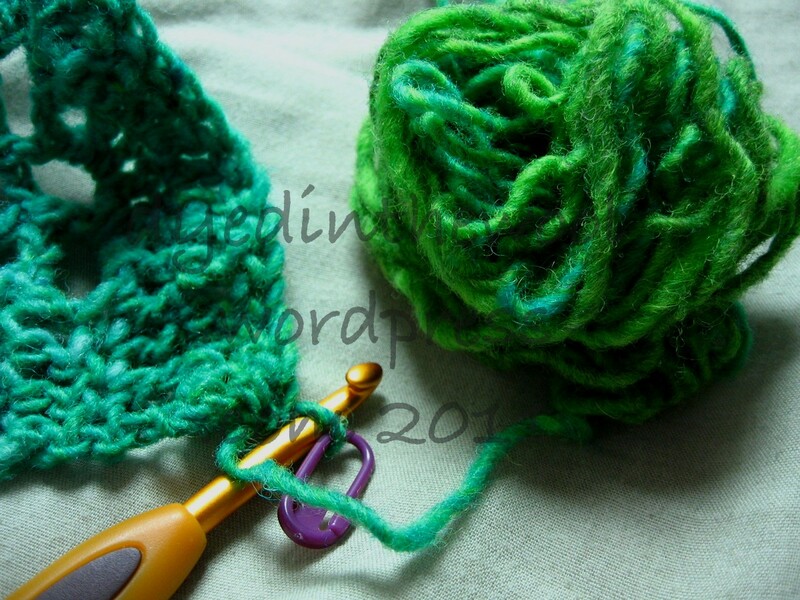 I haven’t been making fast work on this becuase of a slight distraction in the form of a crocheted item for a contest. This is all I can show you. Excited? It’s my first crochet design. I’m nothing if not idiotic fearless. Although the colour is way off (I could not get it right either on the camera or in post-production but it’s much darker and more blue) this is a skein of Posh Yarn‘s Chloe lace-weight. Now with added sparkles! I’m going to use this for a knit-along starting at the beginning of February called The Blooming KAL (run over on Ravelry). 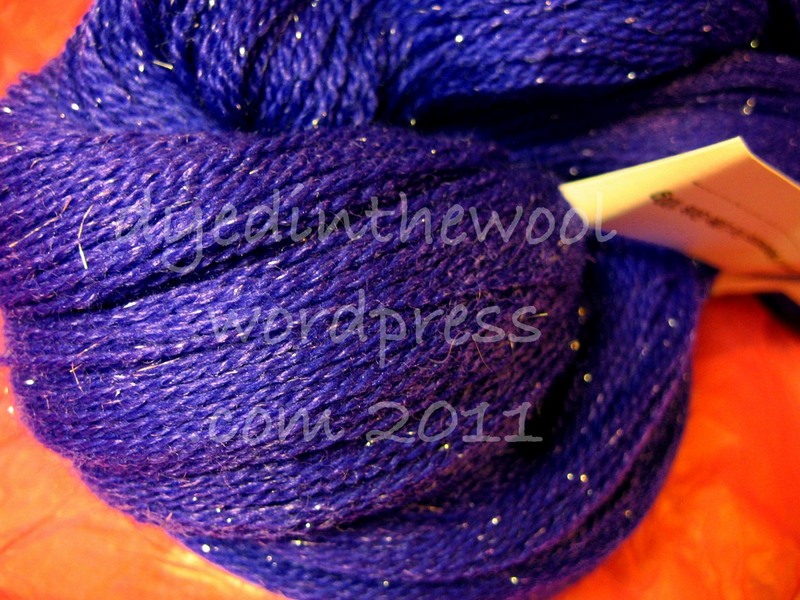 I bought the yarn with birthday money sent by my grandmother. A good investment, I think! Good job I like maths! There’s still plenty of time to enter my birthday contest (comments open until 1pm GMT on the 15th of January). 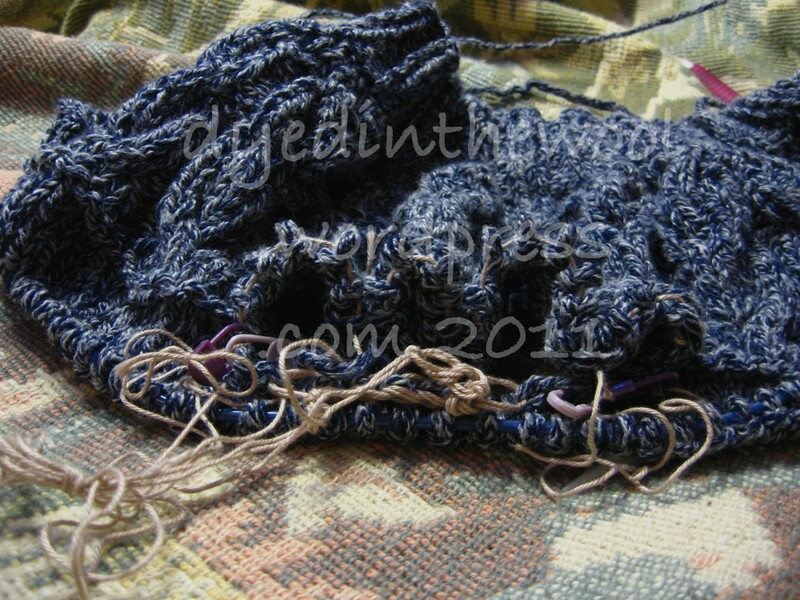 Progress on the first of my 12 in 2011 projects. Not bad really, considering I frogged 210 stitches not once, but twice (due to planning and counting failure), not sleeping properly (3am to 2:30pm is a bit of an odd sleeping pattern, n’est pas?) and being side-swiped by the post-viral-fatigue truck. I’m also planning on dividing for the fronts/back/sleeves in such a way as to give more ease at the front and also adding short row shaping at the bust. 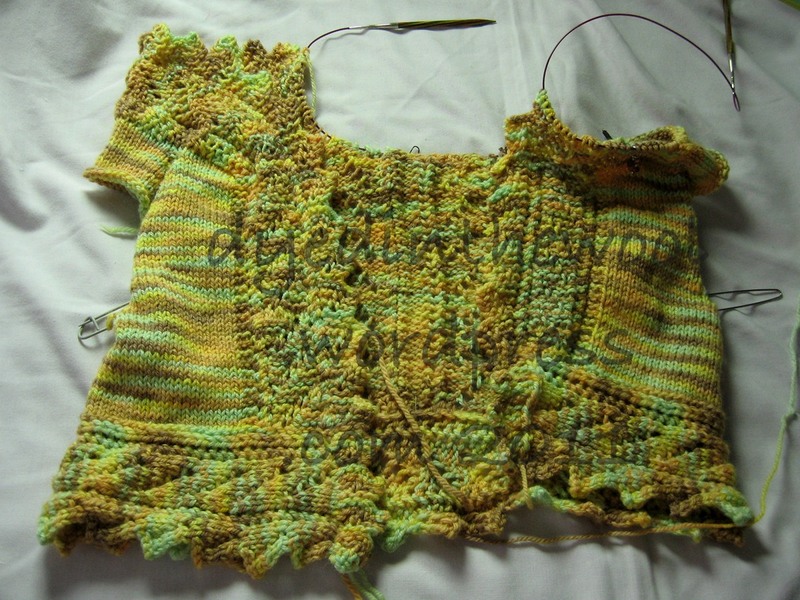 I’m not sure how much cardigan I’ll get out of the yarn I have so I’m planning on knitting the body first and then making the sleeves, so as to get the best use of the available materials. I could end up with a cap-sleeved waistcoat or a long-sleeved jacket! I promise to resort to lolcats only in dire emergencies but this just reminded me of MrsDrWho (she is now a three cat household), and I thought she might like it.